* Gained 56RWHP and 33RWTQ on the dyno! * Cast Finish GT500 owners check out these numbers. 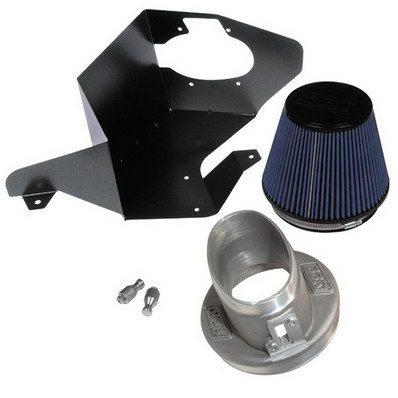 BBK have just finished Dyno testing this ALL new High-Flow Aluminum BBK Mass-Air / Cold-Air Induction kit for the 2007-2009 Ford Mustang GT500 with some great horsepower results. The Cold Air / Mass Air combination gave their test vehicle 56 additional horsepower and 33 ft/lb of torque over stock from the simple 30 minute bolt on and those are real rear wheel numbers! Now thats Bang for the buck !! See below the installation and dyno results from BBK! No one else can Stack up to the bold clean styling of our aftermarket Billet / Stainless Steel Dress Ups, Street / Strip / Racing Suspension and Performance Parts for your American Muscle Car! Fits these Vehicles: 2007 2008 2009 Shelby GT500 Mustang. Made in the USA!